Celebrating the 5th Wedding Anniversary! Has it really been five years since we celebrated the Royal Wedding of Kate and William? Their love continues to blossom, and they capture our hearts with each arrival of the royal blessings. 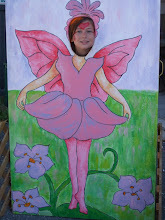 At Sweet Remembrances, we celebrated the wedding with several gala events. This display of all things wedding which included my vintage Barbie Doll in her wedding gown, was set up in the tea room for a week of royal celebrations. 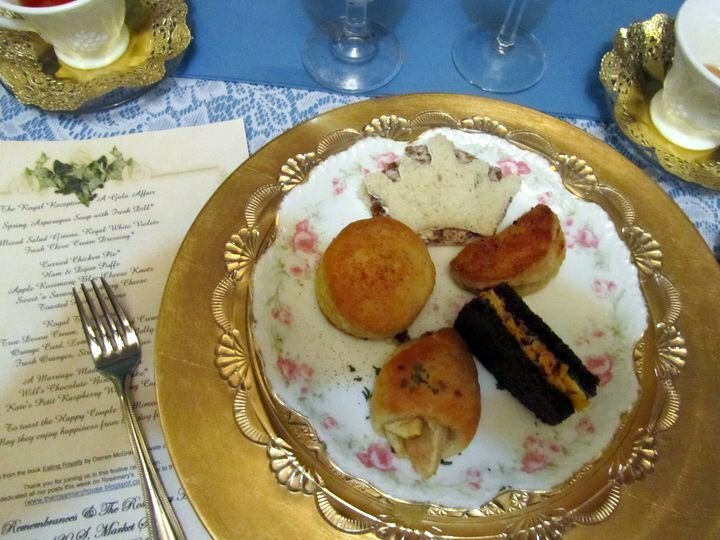 To begin the festivities for the week, Nancy donned a pearl tiara and served a Ladies in Waiting Tea that featured a diamond and sapphire cookie to resemble the engagement ring. A Royal Reception was planned for the following evening. Shown here is the sandwich selection from the Royal Reception that we enjoyed after the wedding. As you can see, gold, crystal, and china were all put into service for such a regal occasion. Dessert included Will and Kate's favorites - a rich chocolate biscuit cake and a sweet petite raspberry wedding cake. It has been fun looking back to the celebrations from five years ago! Here's to the next five! May they be just as happy and blessed with good health, lots of adventure and great joy! Every other month, a group of friends visit Sweet Remembrances for Afternoon Tea. They are a happy lot of work buddies - some are still in the work place, others have since retired - but they gather together to laugh over old times and keep up with friendships forged over the years. During their last visit, they surprised me with an amazing tea themed gift. Nestled in a red cloth box was the most intricate little tea set made using natural bird egg shells. The set, from Mexico, included a petite tea pot crafted with the whole egg, a sugar and creamer also made with the whole egg, and six amazingly delicate little tea cups using half shells that are nestled in small brass fittings to resemble a tea cup. This is the most unique tea set I've ever seen! And it came with a glass display box. Cleverly artistic sister Marj, arranged the tea set in the glass box and tucked geodes, thin pieces of sliced rock, and feathers to compliment the set. What a beautiful treasure to display in the tea room. Thank you so much to fellow tea fanatics that simply knew I would adore this special tea set! Planting Herbs Article from the Archives. This flashback features an April 25,1975 article on planting herbs that appeared in our local Carlisle publication, The Evening Sentinel. Bertha Reppert, the founder of The Rosemary House, discusses different herbs to consider for spring and summer planting. Her Majesty Queen Elizabeth II celebrates her 90th birthday today in Windsor, England, no doubt with pomp and circumstance coupled with glorious pageantry as only the British can do. Celebrations have been ongoing all week. This little collection of English treasures are tucked high on a shelf in Sweet Remembrances Tea Room. The tin on the left, with a portrait of a stately young Queen was sold as a souvenir of the Coronation of Her Majesty Queen Elizabeth II which took place on the 2nd day of June, 1953. Originally it held flavoured Toffees. The small Royal Albert bone china dish was another commemorative piece for the Coronation. With a nod to the Queen Mother, the smaller teapot shaped caddie marks the 100th birthday of Her Majesty Queen Elizabeth. This beautiful Foley Bone China teacup and saucer was made in England and is another tribute to the 1953 Coronation of the Queen. It features the Royal Cypher, or monogram of Elizabeth II Regina. And this beautiful teacup and saucer is part of The Royal Collection and was crafted to commemorate the 80th birthday of Her Majesty Queen Elizabeth II. The Royal Collection Trust Shop has created a teacup and saucer in addition to other official commemorative chinaware in celebration of this milestone 90th birthday. 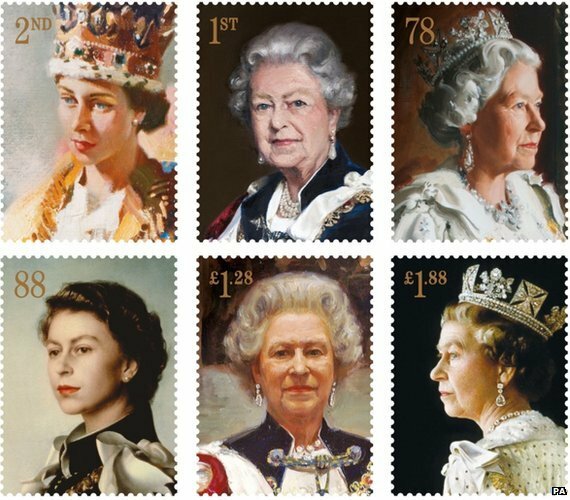 This collection of stamps shows the progression of Her Majesty Queen Elizabeth II over the years. On the occasion of her 21st birthday she promised "my whole life, whether it be long or short, shall be devoted to your service". A promise she continues to steadfastly keep. We have a nice selection of tea pots and tea time treasures available in the shop! Looking for a special gift? The Rosemary House is your place! With the silver polished, the tables set and the aprons starched, the scene was set for our final series of Downton Abbey teas held this past week. Life will go on, but we enjoyed stepping back in time to an era of elegance and sophistication. Angelica poured loose leaf tea from the silver teapots. An assortment of teas were brewed and served throughout the day. Windsor Castle, Blue Lady, French Caramel Creme Brulee, and Decaffeinated Orange Spice were just a few of the assorted teas. With a chill in the springtime air, it was perfect sipping weather. A bowl of Spiced Pecans was on each table for nibbling as all the guests arrived to this sold-out special event. The first course featured a Salad that include Feta cheese, fresh pears, pecans and Parmesan cheese with a Balsamic Vinaigrette Drizzle. After the salad, guests were served Spinach Artichoke Crostini toasty warm from the oven. A second appetizer featured Apple and Blue Cheese Bundles, also freshly baked and served warm. A plate of sandwiches was served to each table. The sandwich course included Chicken Bombay Sandwich on Raisin Bread, Seasonal Asparagus with Egg Yolk Butter, a Cucumber Sandwich with Herbed Mascarpone Cheese and a Carrot-Ginger Round on Multigrain Bread. Scones, always baked fresh and served warm, included Traditional English Cream Scone and an English Countryside Cranberry Scone. They were served with Sweet Cream and Old English Marmalade alongside fresh Orange Slices and Pistachio and Mascarpone Topped Strawberries. Dessert included Lavender Shortbread Florettes, Petite Chocolate Cheesecake, and Coconut and Lemon Curd topped Cake. The printed menu featured quotes from the show. We loved this one from Lady Edith Crawley, "It feels so wild. To be out with a man, drinking and dining in a smart London restaurant." And, from Lady Mary, "People grow up and move away and things change." Did you get a chance to see the full section special advertising supplement that appeared in the Sunday New York Times the week before Downton Abbey aired in January. Thanks to Brother-in-Law Philip for saving his copy, we were happy to be able to pass this around during our tea. It featured a review of all the characters and an update on all the past seasons. And, a letter of thanks and gratitude from Julian Fellowes, the Creator, Writer and Executive Producer of Downton Abbey, leaves us with the possibility of a movie, a stage play or a musical. Any one of those would certainly be fun! Rosemary Gladstar recently traveled to The Rosemary House to present an herbal seminar that included sessions about Backyard Medicine: Weeds of Wonder and Herbs for Natural Energy & Vitality. Prior to the seminar, Susan Kiskis, author, yogini, speaker & whole health guide interviewed Rosemary for an article in her online magazine, Freedom Journal. Susan has graciously granted permission to share the article with our readers. Thank you, Susan! And an extra special Thank you, Rosemary for the outstanding presentation. Known as the “Godmother of American Herbalism,” Gladstar sat down for a cup of lemon balm and chamomile tea blended by The Rosemary House & Gardens owner, Susanna Reppert-Brill. Wearing her trademark moon pendent necklace, dressed in purple, her warmth reflects a nurturing instinct. Despite the late hour, and a delayed flight into Harrisburg, the Vermont resident spoke enthusiastically about her lifelong commitment to herbal medicine. “Everything evolved from my love and passion of plants,” she says about her extensive mark on the herbal world. Born and raised on a dairy farm in Sonoma County, California, Gladstar was heavily influenced by her maternal Armenian grandmother, Mary. Mary and her grandfather met on the death march in Armenia. She told the young Rosemary, God and plants saved her life. Her passion for plants was further cultivated by her family's faith. Members of the Seventh-day Adventist Church, Gladstar was drawn to books from authors from her faith, one of them being Back to Eden, by Jethro Kloss. The groundbreaking book on healing herbs, published in 1939, along with church co-founder Ellen Gould White, who also wrote about herbal and natural healing, helped to shape Gladstar's growing passion. That influence supported her decision at the age of 13 to become a vegetarian, a path she still follows today. After years of backpacking and living in the backwoods of the U.S. and Canada, Gladstar eventually settled back in California where, due to the lack of herbal access, founded Rosemary's Garden, a retail herbal store in 1972. As customers lined up, the interest in knowing herbs more intimately also blossomed. 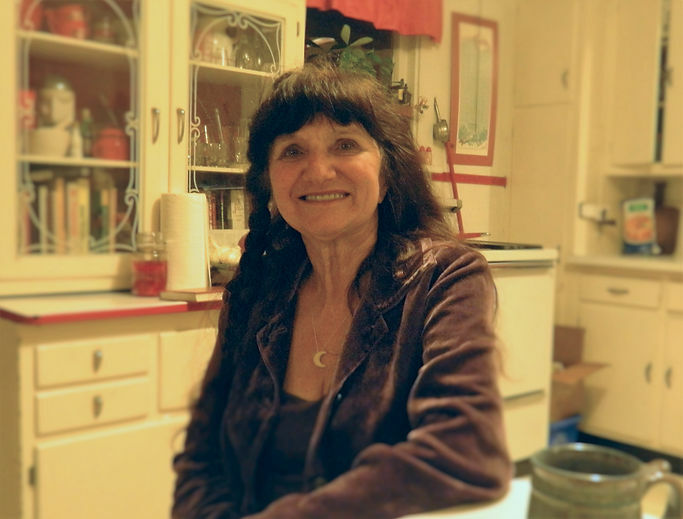 She started teaching small groups, eventually forming one of the oldest, and still surviving herbal school in the U.S., California School of Herbal Studies, in 1978. Following in the footsteps of Kloss and White, Gladstar authored 12 books on herbal healing and co-authored an additional one. From the classic, Herbal Healing for Women to the more current, Rosemary Gladstar's Medicinal Herbs: A Beginner's Guide: 33 Healing Herbs to Know, Grow, and Use, Gladstar has influenced a generation of herbal enthusiasts. Despite her ambitious career she says, she is modest about her legacy. Gladstar never set goals to become an author or entrepreneur, yet life enfolded before her. In 1974, Gladstar and environmentalist Drake Sadler, founded Traditional Medicinals. The company today, no longer run by Gladstar, still ranks their top product sales with her original 13 blends. From "Smooth Move" to "Gypsy Cold Care," Gladstar still cares for those who don't know her name, but understands the connection of herbal remedies to a healthy lifestyle. In 1991, she co-founded the Northeast Herb Association and just a few years later, Gladstar founded, United Plant Savers, a non-profit that serves to protect native medicinal plants in North America and their habitats. Looking at her 44 year career, an outsider would conclude she is a chronic entrepreneur, an author and advocate. However, just skimming through the foundation of each project, you can easily see how herbalism seeded the genesis of each one. Today, Gladstar lives on a 500 acre botanical preserve and farm in Vermont where she runs Sage Mountain Herbal Retreat Center. The 67 year old still travels offering workshops to want-to-be herbalists and garners tens of thousands of views on YouTube with her herbal how-to videos. For more information on Gladstar's retreat center, programs and travel journeys, visit sagemountain.com.